Harlem Lovebirds: I Confess . . .
Izzy watches TV too, it's the only way I get anything done, lol. I noticed which ones capture her full attention, so those as the ones i roll with. I even keep an emergency Blues Clues in the dvr! We go do other things, playing, going outside, numbers, letters, etc, but TV doesn't rot your brain. Doing nothing other THAN tv is what rots your brain, lmbo! You and Nia are always on the go, and doing fun things. 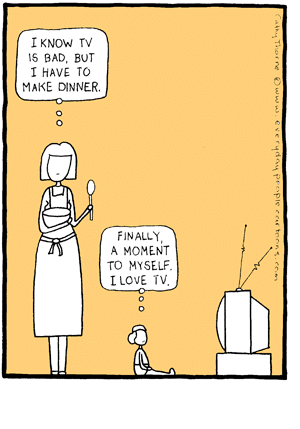 You're an amazing mom, and dare I say "deserve" a tv break sometimes, lol! LOL! I have turned the TV into an emergency babysitter a lot lately. It's the only way I can take a shower in peace. I justify it by telling myself that she's watching educational TV. LOL, this is funny. I have TV but not the channels. I watch dvds or online programmes, but it is not on all the time. I become addicted when I am visiting families. Ha ha! Thank you everyone. Now I don't feel so bad!